Marianne, a busy working professional who travels every week for her job, hired me in March and we finally cleaned out the room in the picture in July. We had 5 sessions of about 4 hours each — we worked just short of 20 hours. Clients often ask me to estimate how long a job will take which is almost impossible to do. This one had many hidden items amongst the clutter. We discovered 5 suitcases filled with clothes she hadn’t seen in years as they had been stored and forgotten about when Marianne spent a year working abroad. This took extra time as Marianne needed to try all the clothing on to decide on keep vs donate. It was worth it as she was able to “go shopping” in her own closet and discovered shirts, slacks, dresses that fit her current size and were classic styles she can wear to work. She’s so busy traveling every week, the weekends are meant for relaxing and spending time with family and friends — not clothes shopping! The rest got sent to donation. She also discovered 10 crumbling cardboard boxes FILLED with memorabilia and items from her high school and college years and prior jobs. That took a long time to go through but necessary. Marianne now lives in a smaller condo vs a house she lived in previously. She wanted to save some items and was ready to let go of others. 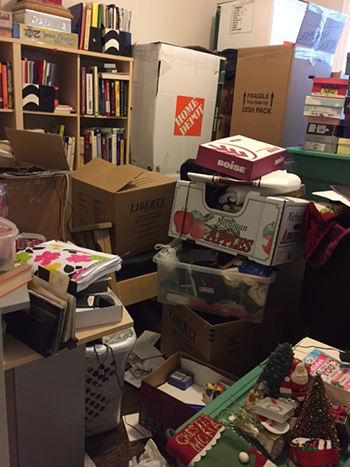 And she needed the presence of her Professional Organizer to help motivate her to keep going with the daunting task of going through those particular boxes. The pace and stamina and focus of the client often determines how long an organizing job will take. We sorted categories of items: pictures, old letters; prior work projects; high school and college memorabilia. We discovered random office supplies mixed in and CD’s and decorative and holiday items. Some items she could still use; many went to donation. Then she made decisions based on how large of a tub she wanted to keep for each category. Pictures can be taken out of frames for easier storage and then digitized. Another category that needed to be streamlined and then simply packed up in tubs to be brought to her storage unit was Christmas. She decided how many tubs she’d keep for holiday items so kept only her favorite decorations. 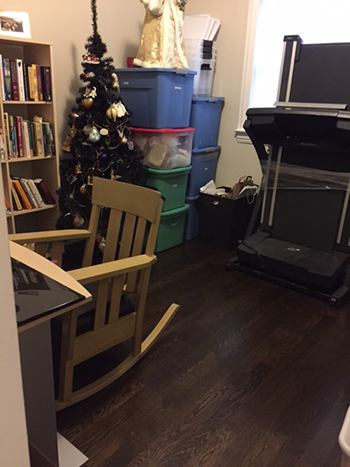 She then realized she’d only get her room back to use as a home office if all the items were packed away in large tubs and them removed from the room so she could have more space and not feel so cramped. There was no other place in the condo to store them since she no longer had a large garage, attic, basement. There were huge donation pickups of clothes / shoes / coats / electronics / bedding / office supplies / decorative and holiday items / jewelry / frames / kitchen items. Marianne got rid of a lot of things that no longer served her current lifestyle and smaller living space. It’s amazing how much stuff was in that room (and her guest room closet and master closet) that she parted with — but yet still had plenty of possessions when the job was complete. It was a great accomplishment as Marianne didn’t think it would ever be possible. She didn’t know how to start. She didn’t have the motivation to finish the project on her own, and she needed the extra set of hands from me, her Professional Organizer, to keep the project moving.